Hi, everyone! 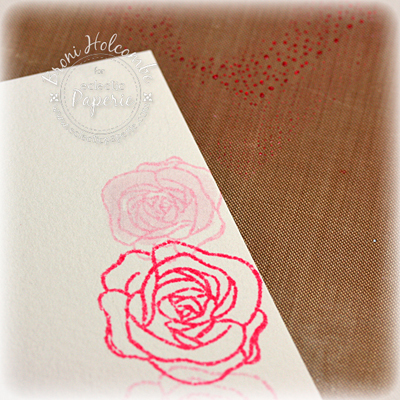 Broni here, and today I have a quick & easy card that really doesn't look quick & easy! I used the Sweet Victoria stamp set from Sweet Stamp Shop. It's perfect for this type of card! I stamped my flower outlines in Distress inks on some watercolor paper. Then I took my water brush and colored them in, using some extra ink that I had smashed onto my craft sheet. No need to be neat....just slap on the ink! Next I stamped the leaves in some Shabby Shutters ink, then I spritzed the whole thing with water using a mini-mister. I dried it with my heat tool, rounded the right edges of it and all my other layers. I stamped the silhouette in Memento Gray Flannel ink, cut it out and popped it up on Scotch foam mounting tape. Then I stamped the sentiment in the same Gray Flannel and tied the ribbon on. I attached all the layers together and I was done! Wow! It took me just as long to put this post together as it did to make the card! That's it for me. Thanks so much for stopping in and I hope you have a fabulous weekend! 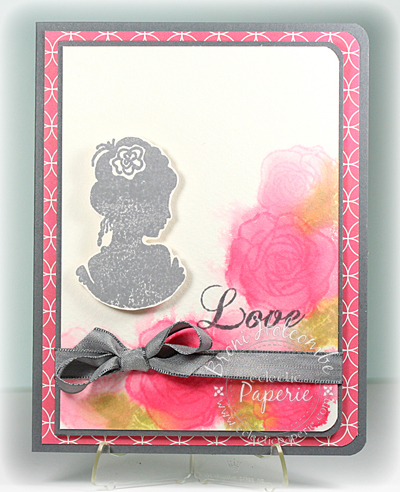 I love the softness of this card...and the pink and grey color combo is wonderful! Pink and gray is such an elegant colour combination. I really like the watercolour effect you achieved on the stamped images. So soft and pretty. Just gorgeous! Oh my goodness, I missed this until just now...Stunning card Broni! So beautiful!! This is so beautiful! I'm totally 'pinning' this! Amazing! This is so soft and romantic looking!